Lil Wayne now claims in his bitter lawsuit against Birdman and Cash Money, he has letters from Drake and Tyga's people claiming they got stiffed out of a fortune. And Nicki's people say in a separate letter her producers also got shortchanged by Young Money, and Wayne says it's Cash Money's responsibility to pay producers. 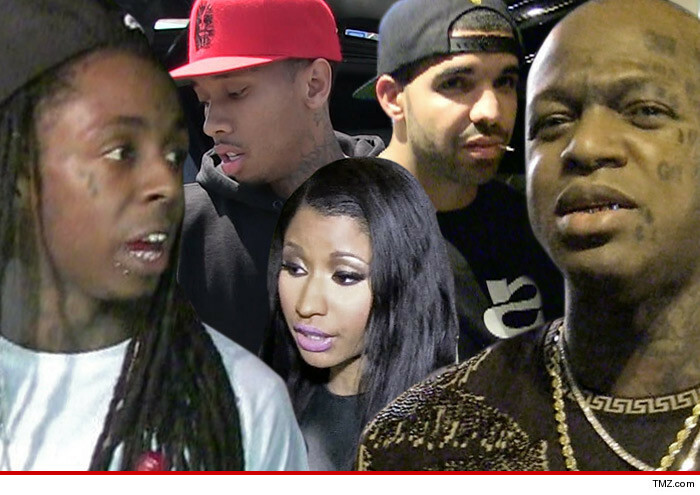 As you know, Lil Wayne runs Young Money, whose stable of artists include Drake, Nicki and Tyga. Cash Money is the parent company of Young Money, and Birdman is the big boss. The allegations of Cash Money's financial shenanigans are massive. Young Money clams it was supposed to get a big chunk of a $100 million advance from Universal -- an advance that went directly to Cash Money -- and they're still waiting. But Cash Money says Wayne and company are full of it. They gave him a $20 million advance for Young Money in 2012, another $12 million for Wayne's solo album and another $70 million in advances, royalties, marketing and recording costs for various Young Money artists. Cash Money claims in the docs if anyone is a slacker it's Wayne ... he was supposed to deliver 21 albums over 7 years for his artists and only anted up 13.